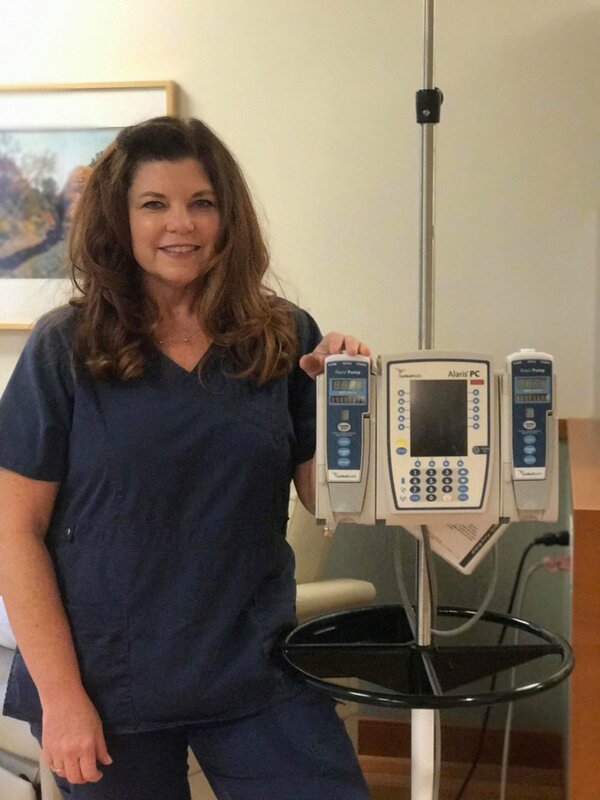 After being a nurse in hospitals and in clinic throughout the U.S., Jennifer Hagerty still loves the job. She now works with cancer patients at a Northern California clinic. Her message to patients and their families: nurses aren't just there to give you the treatment, they're one lifeline to answers and even emotional support. What's something you might say to new patients? How do you explain treatment side effects? What are the doctor and nurse roles? What do most patients ask about? Is it different in clinic and in the hospital? Do you talk more with patients or with their families? Are you different with each patient? Have you noticed any patterns with patients? Can patients request a nurse? What's something you'd like to tell patients? Advice on how to manage treatment? What questions should patients ask? I like to arrive early to work and see what my assignment is, go through do some research, and if it’s somebody’s first day, I’m always anticipating anxieties. Anxieties are tough. You’re throwing somebody into a situation that they’ve never experienced before so I like to be ahead of the game if something like that is really happening that day. If it’s my usual clientele then I go back and read [the] last notes of the physician or if they’ve been in the emergency room or anything that’s happened since the last time I’ve seen them. When [the patients] come in, each one is separated out, they come in and I ask them, "What’s new? How are you feeling?" If I notice something in the notes before then I go through and say, "Okay, last time you were here or since the last time you were, you went to the ER or this was happening" and I like to go into that a little bit further. Or "I noticed you had mouth sores since you were here last, how are they doing? What’s going on?" And from that point, I expand my assessment as nursing. My suggestion is that we go through today together, we better understand what’s going to happen and the next time we come back in you can tell me how things worked out. If you had some side effects that weren’t working so well for you or where you were sitting in clinic, and it was a little too noisy for you. We can move you to a quieter place. Or, "Hey I went home after being on [this drug] for two days, I couldn’t sleep, I don’t know what’s going to happen, and I need you to help me figure this out because my life is not good if I cant sleep for two days. Then I’m just not happy for everybody." It’s definitely possible for you to have a little bit of say in what’s going on and to help mold how your treatment’s going. Obviously you’re still going to have to get the treatment but we need to figure out how the treatment works best for you. The biggest chunk is the side effects of what’s going on. Another aspect of things is the emotional side and where do I go from here? We always have ideas. There’s social work. There’s communities, there’s online boards, and messaging. For first time chemo [patients], I can sit down and read you every possible side effect. It doesn’t matter what chemo it is - they all have side effects. My main goal is to get across to you, to stress that you may not be "in the box." You may be having a side effect that no one’s ever heard of before but that's what I need to know. So even if you’re fitting into the fatigue or the fever or the vomiting or whatever, I need to know about that, but if you have something on your hangnail that’s bothering you, I want to know that as well. It’s all important. We’re all not cookie-cutter, we’re all different, and every little bit of information that you can feed to me is better. It’s a puzzle. If we knew how to fit all the pieces of the puzzle together, we wouldn’t be here. So that’s the goal is to make sure we can figure your puzzle out. From that aspect we take the pieces and we try to figure out what’s the best medication for you. We can call the doctor, we can call the nurse practitioner, we can suggest things. We can try to do as much as we can but the ultimate goal is to give all the information to the physician in charge and they make the decision. What’s the best care or what’s the best drug or regimen for this patient? That’s a joined role. The doctor will prescribe the medicine for you. Sometimes they’ll go through the side effects. Sometimes nurses do what we call “teaching.” That’s where we sit down and go through, "Here’s the drug, this is what it is, here are the side effects that most people have," and that’s when I stress the point that if you don’t have something that’s on the list, I still need to know about it. We make sure they have the right numbers to call if there are issues. If there are questions, make sure they know when to go to the ER, when to call us. That’s definitely a group between the doctors and nurses, it just depends on who is assigned to it. We know that [the doctor's] the prescriber, we are the reporter. We report to the patient about what’s going to happen, how you’re going to feel, things that are going to change. But we also gather information as a reporter too, right? We want to know how are you feeling, what are the side effects you may have. It’s definitely an information gatherer and giver as nursing. So the doctor can still do all the education. We just go back and make sure they’re reeducated and things are always gone over. Sometimes when the patient comes in the first time you can go over the information but they’re so stressed out and so anxious, they don’t remember anything that you say. So you go through it, you walk through it and then the second time they come back in, they realize maybe it wasn’t as bad as they had anticipated and they’re more open to listening and finding out information. Your patient who was so sick comes in, sees you, gives you a hug, and says thank you. Or you see them in the mall laughing and carrying on with family or friends or a significant other, having children, having a life, a new chapter. The bridge has been built, you’ve crossed the bridge and you’ve moved on. It’s great. It’s happy. I think it’s generally the same across the board. Patients are scared. They’re going down a road they’ve never seen before, had before. Most of the time, no one has had their same disease before. They may have had friends that had another sort of disease but not this one and they’re scared. And cancer’s not just a disease, it’s [the] emotional baggage that comes with it. You have to cure both the mind and the body. Sometimes patients don’t like to tell you anything and the family member likes to tell you everything. The patient gets really upset because they don’t want everybody to know. "Okay, I’ve been sick for three days but I don’t really want to tell you this because that means I’m going to go into the hospital." So I sit there and I listen and I watch for cues from the patient. Just looking at the patient’s face while the other caretaker’s telling you what’s going on. They’ll either tell you by face, "Yes, this is going on" with a disgusted look or "Okay, it’s true, this is really what’s going on." And from that aspect I start my assessment. I start asking questions. And if the patient still refuses to tell me, I look to the caregiver to give me some information. My great grandmother went back to nursing school when she was older. She was a hero to me. Unfortunately I didn’t know her well, but I have some of her old nursing books. The human touch is something that you either have or you don’t. And as a nurse I hope that I extend that human touch and that emotional bond that I can provide for somebody while they’re not doing so great. It's a gift and as some people say, I found my calling. And I hope truly patients do feel that way and I can inspire others. I'm always trying to get young people to look at nursing, it sounds like a glorified job but it can’t be all the time. There’s not-so-great things that come with it, as well as great things. It’s just a human love. A calling that is fantastic. It doesn’t feel like I go to work. I go see my family. It all goes back to that human-touch relationship. Establishing relationships. They’re comfortable with me. I have one person who comes in, all we talk about is fashion, baking, and cake decorating, and it’s the best two-and-a-half hours! We’re both laughing and, "Oh my gosh, did you see what she was wearing?" And it’s fantastic, it’s great for both of us. When patients come in and say, "Hey, you made chemo fun!" That should be what it’s about. You’re not here to have the worst time of your life, you’re here for distraction and to have fun. "I have to go in Wednesday at nine o' clock but it’s not so bad because everybody there’s fun and carrying on and having a good time. And I get what I need to get, I get what my needs are as far as treatment, but I also get a social life with it, right? Yes. Sometimes you don’t ask a whole lot. You sit down quietly, start an IV, and they begin to talk and they begin to tell you what’s going on. Each patient is different. You have to learn personalities and find out what’s the best way that they communicate. That is the joy of Oncology. That is because you get to build a relationship. You see these guys over and over again. It’s fantastic because you [build] relationships with them and because you see them so often, you notice things. It could be as simple as "You got new glasses since the last time you were here" or it could be, "I noticed you have a little rash on the side of your neck, what’s going on with this?" That’s the fortunate thing of working in Oncology - the complete whole body. You get to see and assess every time that they come in. Sometimes it’s not a physical thing that’s wrong with them, it’s an emotional thing and nursing not only is great for that, where you can sit and take the time to listen a little bit and validate what’s going on, but you can also suggest, "Hey, I have somebody that you may need to talk to" or "I have another patient that kind of went through the same thing and let’s see if we can get you guys together." That’s the joy of my relationship with patients, is the relationship-building and establishments you get to have. The one thing I’ve noticed about the oncology patient is no matter how many times they have to come in for how many years, they’re always in good spirits! I never had that in nursing before. The acute care or the appendicitis comes in and it's "you’re disrupting my day," "you’re not making things work out for me." I never hear that from an oncology patient. They’re grateful, they’re happy as happy as you can be and they look forward to everything like goals. That is the one true thing that I have noticed in oncology patients. They are just there to get better. If you’re sick sometimes you don’t feel well and they may not be themselves but for the most part the personalities are just amazing. I can’t say that if I was put in the same spot that I would always be so happy and grateful to see somebody. Clinic-wise (outpatient) patients are much more stable, they’re ambulatory, they get up and go to the bathroom themselves, they’re not hooked to a million things. They come in, they leave, see you tomorrow. That’s great, too - they still have a life. You learn about their life. In the hospital, you have to stay in your room. We have to do this, we have to do that, and that’s hard for a patient emotionally. The emotional relationship on the outside with their family and nursing and everything else is definitely a better perspective. Different hospitals, if you get your own cells back, will transplant you outpatient. If you don’t get your own cells back, for the most part it’s still an inpatient procedure - it’s dangerous - you just want to make sure that everybody’s safe. As you know with neutropenia (low white blood cells) it’s really hard, when you get someone else’s cells, we want to make sure that you don’t reject them, that things are going okay and we can keep an eye on you at all times. When you’re getting your own cells back, there’s less of a chance of issues to happen. Patients are much healthier. They don’t have to deal with the hospital life of hospital food. They can go out and do what they need to do - nurture themselves. Patients enjoy being prisoner in their own home versus prisoner in a hospital room. It's healthier mentally. My favorite memory is setting something up for a patient and seeing the surprise on their face. I had patients that came in and I’d decorate their bed for their birthday or Valentine’s Day. I had an older gentleman come in and I threw rosebuds down right with balloons! He was so embarrassed but was so touched at the same time. It’s that kind of stuff. And he’ll come in and I’ll shave him, little things. So, little things you can do in clinic whether it be something silly, like when they fall asleep and you leave a note on their chest that says "boring" and they wake up and they realize this note is on their chest and they get a laugh. Obviously you learn to know the personalities of each patient, who you can do this to and who you can’t do this to. It’s returned full circle by the patients when they come in and are like, “How are your dogs? What did you do this weekend?” It’s not all strictly about disease, it’s about an emotional therapy, too. Can patients request a specific nurse? (Not in hospitals, but in clinics) Patients do request and yes, if they’re comfortable with me, if they’re happy with me, I say you can request me. I may not be here but you can put my name down and if I'm here they do everything they possibly can to match us up. And some nurses just know, "Hey this guy’s coming in. That’s Jen’s." They go right to him, they don’t request anymore, they just know. You have this disease but it’s not just physical, there’s an emotional side that comes with it. And what patients forget, too, is hey I was diagnosed. Guess what, you’re going for scans, you’re going for treatment, you’re going for radiology, this, that, this, then you’re done. That’s so hard for patients. That’s something that I feel like nursing loses a little bit. We’re all in the moment and all in that but once we’re done with treatment we never see you again, and then there’s a different side of that, a recovery side of it that doesn’t get established well in clinic. That’s hard I think. You were diagnosed, your life stopped, your life became doctor appointments and chemotherapy and scans and everything else. Then when it stopped, your life as you knew it before didn’t come back. You had a new life for a little while and now you’ve seen new things in the world and you realize what’s important and what goals are now established. And you’re not sure how to get there, and that in itself is really hard for patients. It depends on how they best learn. I suggest they sit and listen, take in as much as they can. And after that, start a journal. Every thought and question that you may have, write it down, because next time you see me or the next time you see the physician, you may not remember everything. And you don’t let that person leave until you’ve gone through the journal and say wait a second, I just want to make sure I have all my questions asked. Give them the time to write things down, reflect, and next time they come back, they’ll probably have more information they’ll want to gather or have more questions or thought process. The journal to me is the best. I can’t push that enough because we all have been in that situation where we just lose our thought process and all of a sudden the physician’s gone or the nurse is gone or the nurse practitioner ran in and they’re moving on, and you’re overwhelmed, you forget to look at things. So I always say take it out, put it on your lap, make sure they don’t leave until you’ve gone through everything. Also, bring somebody you love, bring somebody that you trust, and somebody who’s going to be your best support because where you may not hear things, they will. They are there to have your best interest in mind. You are there to gather what you can but you’re so overwhelmed, you’re with a new diagnosis, you’re not sure what to expect, you’re not even sure if the questions are all going to come to you at the same time. One of the biggest questions I get before I give somebody chemotherapy is - is this going to hurt? Whereas we may have talked to you about it in clinic, it’s just one of those things that no matter how much we can stress certain things to you, you’re not going to gather all that information at once. So somebody else with you, a caregiver, maybe the same caregiver to help with you throughout the whole time so they understand what’s going on, would be the best situation, right, where you miss things, they can help gather that information. And sometimes they get a different perspective on things. "What do I do in an emergency?" Make sure you have the phone numbers of where you need to call, make sure you know where to call, who to call if something happens, if you’re far from your hospital and you have a fever, know that you have to probably go right to the emergency room locally and have them call the hospital, the main treating hospital, to make sure everything’s okay. That’s the big thing. Make sure you have the right numbers, the right names, the right protocol for what you need in an emergency. It doesn’t matter if we’ve told you 15 times. If you’re still unsure, that’s your life we need to take care of.